Hi friends! It's Club Scrap Blog Hop time again! If you've come from Hetty's Blog then you're following right along! This month's kit is called Succulents. It features images of succulent plants with gorgeous greens, pink and burgundy colors. 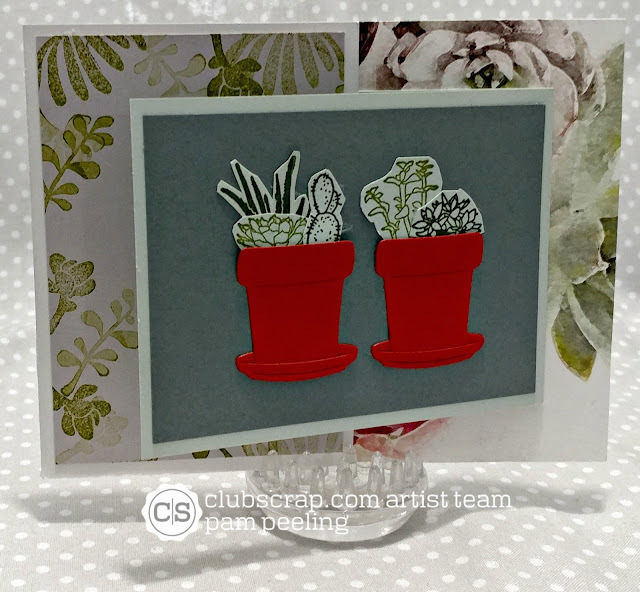 I made a set of cards in a flower pot! I used the instructions for a card purse and altered it to make a flower pot. I cut the base 12" x 4 1/2" so it would be taller. I didn't add the bottom strip or the little handles. For the top of the pot that overlaps I cut the card stock 12" x 2". I scored it at 1/2" and 1 1/2". I folded the bottom under before adhering the top to the inside and folding it over the top to form the rim. My first card is an Inside Gate card. I stamped images from the unmounted stamps you can get with the kit. 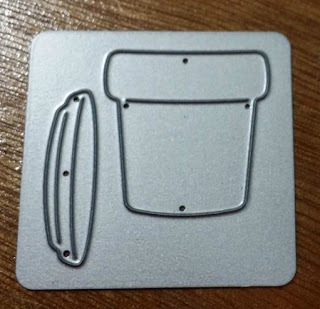 I made the little flower pots with this adorable little die cut I found on amazon! So cute! 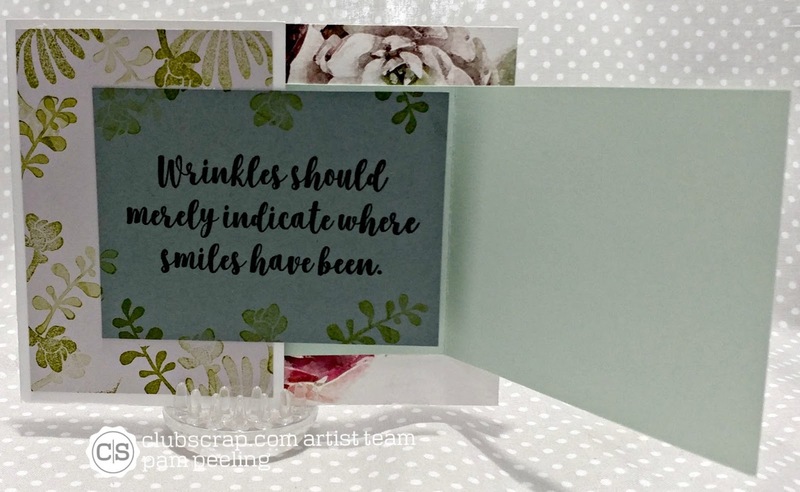 I altered the card a bit and added this panel inside for the sentiment. 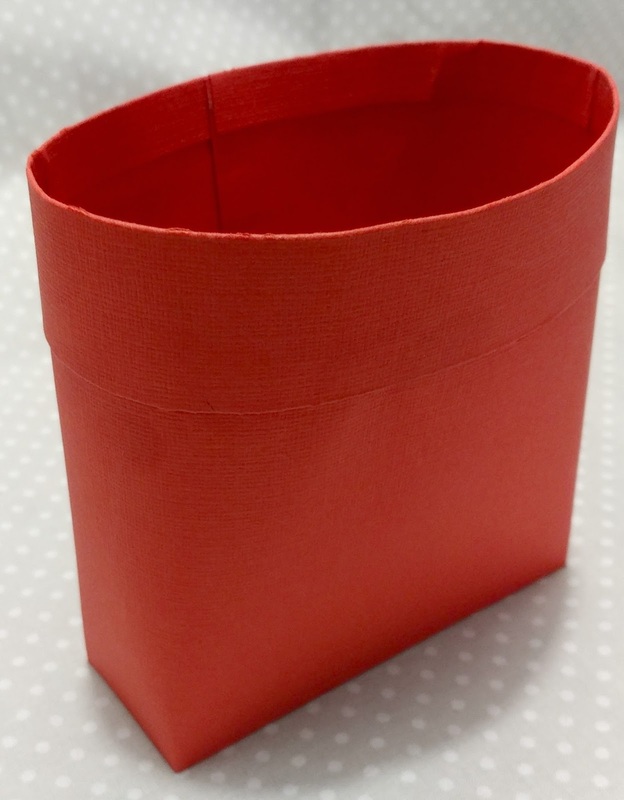 I used the patterned paper from the kit and folded the printed side to the inside. The background for this card is a piece of printed paper from the kit. The button and ribbon are from the embellishment pack from the kit. This is a gate fold card. 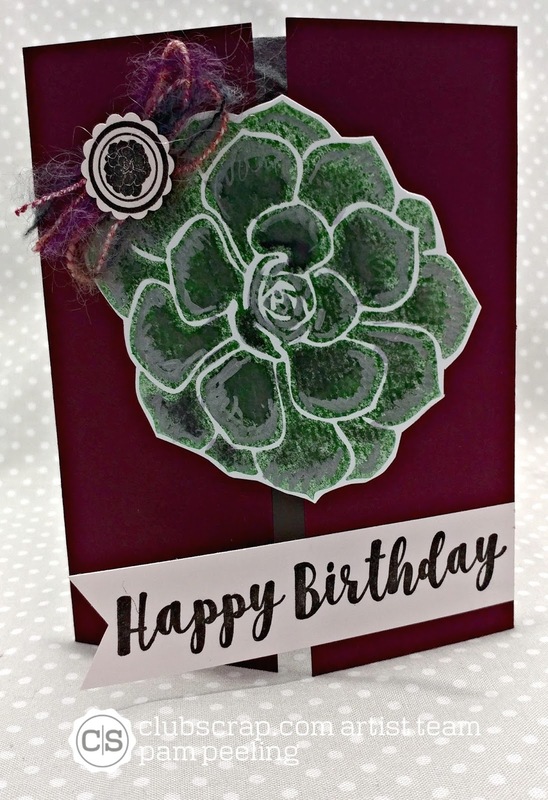 I stamped the succulent image with a basic green and then enhanced it with a water brush and more ink. Then I used the metallic silver pen from the "Color Me Happy" kit to enhance the image even more. The flower is mounted on one side and the sentiment is on the other. I did the same thing with this card of folding the patterned paper so the design is on the inside. It's hard to tell from the photo but the paper has metallic silver coloring to it. I cut out one of the flower images from a 12" x 12" printed paper from the kit. 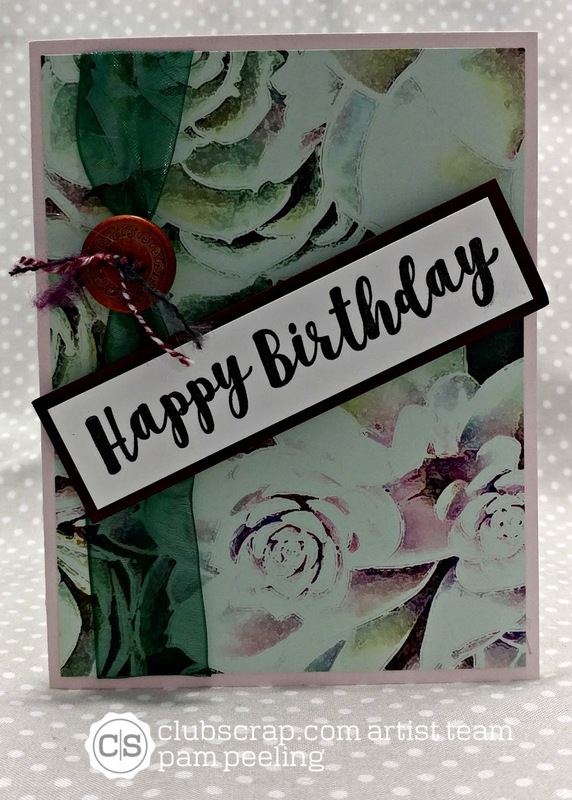 The ribbon on this card is from the embellishment pack from this kit. Your next stop on the hop is Tricia's Blog! And make sure to link up a project of your own to the linky party! Pam, I love how you made the purse into a flowerpot with cards. 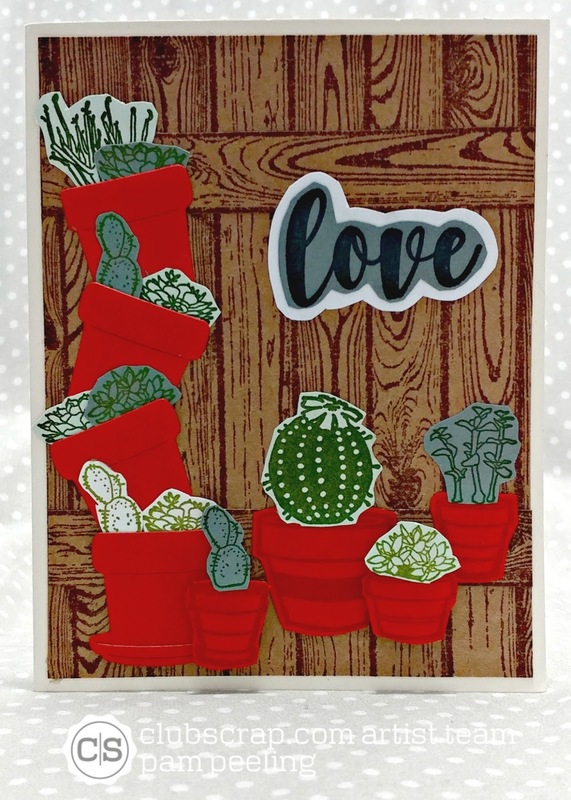 Such a great find that pot die and you used it to make a bunch of wonderful cards. Tremendous use of this kit. Your projects are delightful. Lovely cards - I don't think I could choose a favorite if I had to! Wow so many great cards! I love that you found that diecut, it works great with this kit! 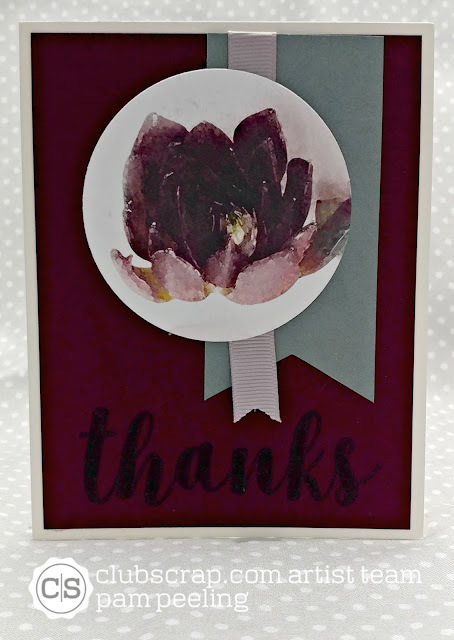 Beautiful cards you have created! Love them all! Such fun! Love the pop of red the terra-cotta pots make on your projects! Great work Pam! Gorgeous cards hun!!! Love them all! Stunning cards! 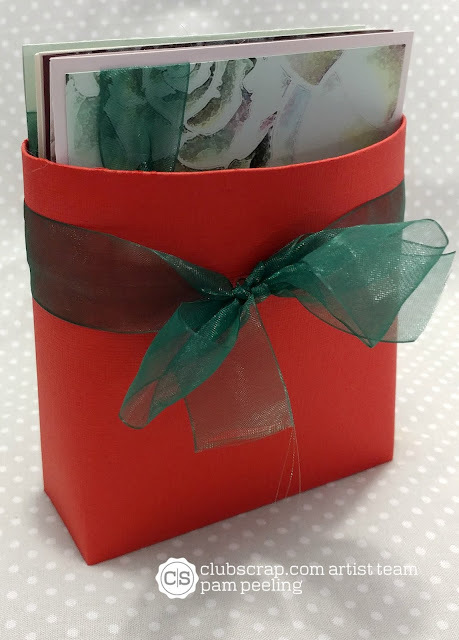 I'm always looking for new ways to package cards, love this flower pot! 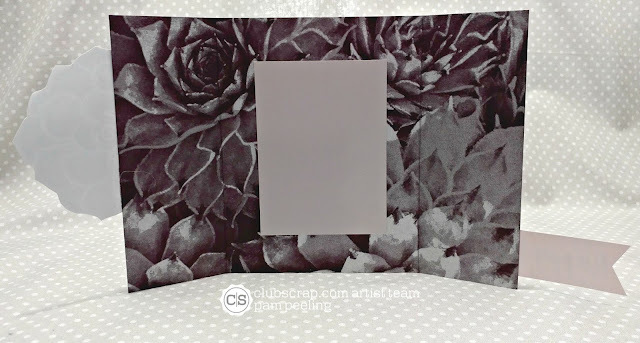 That floral image you added on the gatefold card is stunning. That silver pen was a nice touch! Love all these cards, Pam! Great use of the collection and thanks for the inspiration. 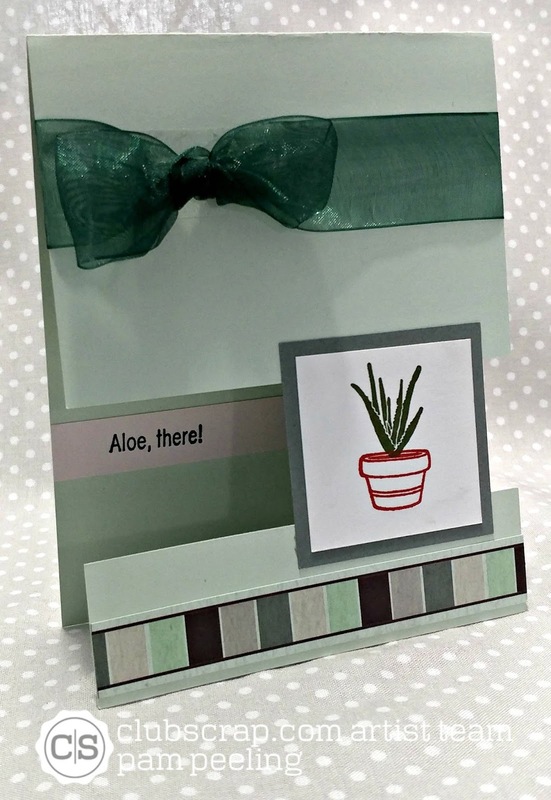 Wow, super cool card holding flower pot! All your cards look so clever, classy and unique! Great cards and what a clever "box" for gifting them! Hahaha LOVE the "pot" for the cards - awesome idea!! 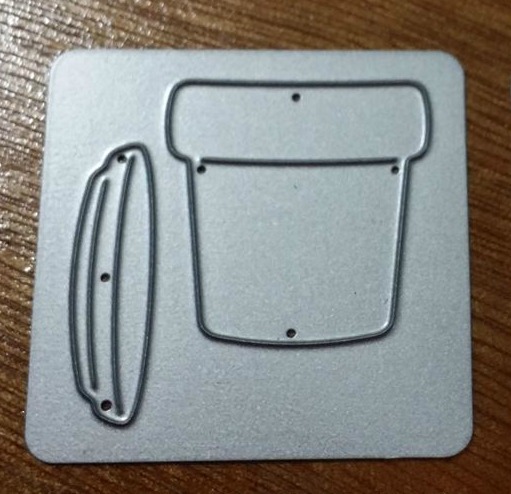 How adorable that pot card holder is. Love all your cards. Those cards are awesome! Love the flower pot box and the little die!